This stuffed hamburger recipe was really fun to make, and everyone loved it. Allow me to explain how this stuffed hamburger recipe got tested here at my house. I was in the mood to do something on the grill that was totally different and entirely “off the wall.” My main concern was my wife. She is not as carnivorous as I am. Don't get me wrong. She loves a great steak or a pulled pork sandwich as well as anyone, but this dish borders on meat mayhem, so I decided to do the honorable thing and not tell her what was for dinner when she inquired. Sorry, a grilling artist cannot be bothered with such details while planning a carnivorous masterpiece. I then texted my son and told him we would be having a real treat for dinner that night. He texted me back and came closer than he knew in his attempt to guess the dish. “Is it steak wrapped in steak?” For a moment I thought he had some sort of ESP. On to the recipe for this stuffed hamburger. Basically, this is a seasoned pork and beef patty wrapped around a premium hot dog with mozzarella cheese. 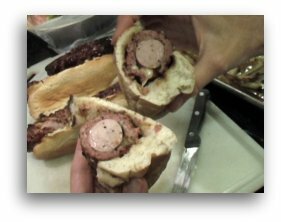 It is grilled and then served on a large hot dog bun, the kind you use for a brat or a sausage. This could have been one of the most popular grilled dishes I have made, especially with the kids. My wife even liked it, meat mayhem and all. This recipe is good for 6 hot dogs. Thoroughly mix these ingredients until all is completely incorporated. Now, cut six pieces of cling wrap. Take 1/6th of the beef and pork mixture and spread out on one of the cling wrap pieces. It should be long enough and wide enough to fully cover the hot dog, and it should be no more than ½ inch thick. Place the hot dog in the middle of the patty and place string mozzarella cheese next to the hot dog. Now, pull the edges of the cling wrap up so the meat fully covers the hot dog. Firmly form the meat around the hot dog and tightly close the cling wrap around the meat. Place them in the refrigerator for an hour or so, allowing them to firm up a bit. Grill on your kettle grill using indirect heat for 20 to 30 minutes. If you use gas, do not grill directly over a burner. Then finish off over the direct heat while basting with your favorite barbecue sauce. Serve on a toasted sausage/brat bun and enjoy. Any beer or any wine works with this dish! Do you have any questions about this recipe, or grilling and barbecue in general? He typically responds personally via email within 24 hours, probably sooner! Click Here and ask away! Join Dave's online barbecue newsletter for additional recipes, articles and tips. Just fill out the info below. return to the barbecue pork page.